If you are not using social media to find a job, you need to start. If you are using social media, ensure you are using it as effectively as possible. See ‘How to optimise your LinkedIn presence’ to set up your profile & create your on-line professional brand. LinkedIn is a social networking site for professionals. It is tremendously powerful when looking for a new job. The more people you have in your LinkedIn network the greater the chance someone may be able to help with your job search. When you connect with someone on LinkedIn, you have access to interact directly with them, plus you can also gain access to their connections. If you pay for a subscription, you can access 3rd level connections. Very quickly you can build a massive network. Let’s illustrate this with a real life example. The person below has 874 direct connections; this links them to over 13 million people! Surely one of these 13 million people is in a position to help in their job search, either by offering a job or by referring them to someone who has a job opening. As LinkedIn grows in popularity, so will your network. When you and everyone in your network adds more connections, the number of people you have access to will exponentially increase. LinkedIn is dynamic; therefore the investment you make today will pay off not only for this job search but also for future job searches. How do you get people to accept your connection request? People tend to use LinkedIn in two ways. The first is to build their LinkedIn connections wide and broad, the other is to keep it limited to people they personally know. When looking for a new job, my advice is to get as many connections as you can. As illustrated above the more connections you have the bigger your audience. Think about why you want to connect to someone before you send a request. When you connect with someone you know, they are likely to connect with you. However, you may want to connect with people you don’t know as part of your strategy to tap into the hidden job market. If you choose to adopt this strategy you need to generate a high acceptance rate otherwise you may be seen as a spammer and LinkedIn may impose restrictions on you. When you are expanding your network to people you don’t know, follow these two steps. Once you have targeted someone you want to connect with, first view their profile to learn more about them, then try and find some area of commonality. This could be that they studied at the same university, obtained the same degree, know someone you know, worked for the same company as you or are in the same group. If you have nothing in common, as a last resort, you could mention in your connection request that you are interested in their company or industry. Before you connect think through why you want to connect. Think about the value you can add to them rather than what they can give to you. Click on the persons profile, then press the connect button. Some people put strict parameters, which only allow you to connect if you have their email. If you can find their email, you can then connect. When connecting, if you click I don’t know them, LinkedIn will not allow you to send the request. You therefore need to know them via a group or choose colleague, or we’ve done business together. When you click ‘connect’ delete the standard text and replace it with a tailored request. See below for examples. If someone does not accept your request to connect, that’s Ok, don’t worry about it or take it personally his or her strategy may simply be different to yours. 1. To increase your connections quickly, target a LION. These are LinkedIn Open Networkers. These people tend to accept everyone’s request. 2. Join groups where the people in a position to hire you are likely to be members. LinkedIn allows you to join up to 50 groups. 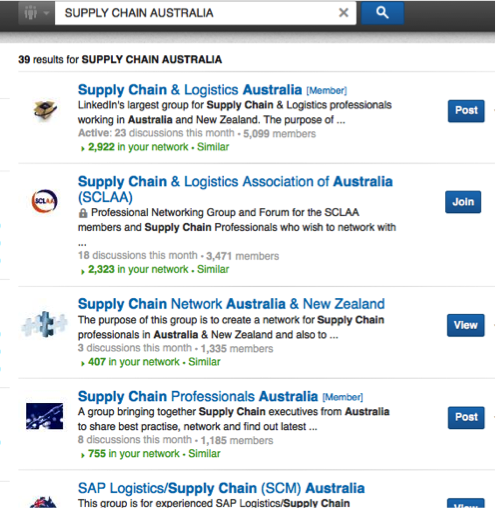 As an example, if you were looking for a supply chain analyst role, you could type in supply chain Australia and join the groups listed. Some groups grant automatic access whilst others need to approve your request. The approval request is based on the membership criteria which will be written in the group description. Once you have joined a group, you can send a connection to members of the group by selecting Groups. See example below. Remember never send the standard note. When using LinkedIn to find a new position connect with Line Managers in your target organisation as opposed to Human Resources or Recruiters. Line Managers are more likely to connect with you and provide information about job openings. Use the keyword search to find the person you want to connect with. This can be found by clicking the word ‘Advanced’, next to the search bar. Next type in your search criteria. In the example to the right, we are looking for a Financial Controller, who works at or has worked at Orica in Melbourne (3000 postcode). When you get the results, you will find people who may still be employed at Orica or who have worked at Orica. All will have finance in their profile. If you don’t know the name of the line manager you want to connect with because they don’t come up in your search, connect with anyone in the company you are interested in regardless of position. Once they have connected with you, they may be connected to the person you want. You can also use this person as a lead to access the person you actually want to connect with. Once your connection has been accepted, you can send a message to the person thanking them for connecting and ask for an introduction to the person you ideally seek to connect with. Below is an example of an email you could send. Use the alumni section on LinkedIn to find people who went to the same school, university or company as you. Then connect with these people. Once someone accepts your connection. Send them a ‘thank you’ message. This will demonstrate your ‘good manners’ plus it reminds the person who you are and sets up a further interaction. An example of a thank you message is below. Be aware don’t send out requests from your mobile, as the app sends out a standard connection requests. Endorse people as they may endorse you back. (endorsements make you look more credible). Decide how you want to be known, then post interesting articles or blogs for your connections to read. Ensure you are always positive and professional. If you want to be known as a thought leader or someone who is well researched, then post interesting information about your industry, product or service. If you want to be known for as expert in your job role, post tips and advice. For example a project manager may post information on how to run projects, details on project management software, tips on project management strategies etc. Ensure your LinkedIn brand represents you in a manner, which will position you as someone an organisation would like to employ. LinkedIn is NOT the forum to complain about the employment market, past employers, your industry or recruitment consultants! 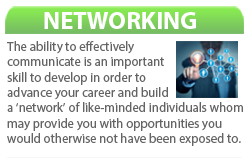 After obtaining connections on LinkedIn, start networking with them. Read the Hidden Job Market section for advice on how to do this. 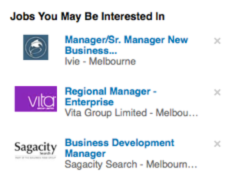 On the right hand side of your profile section, LinkedIn displays jobs that you may be interested in based on the key words found in your profile. 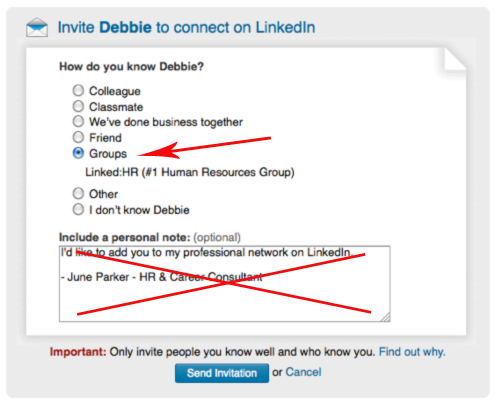 LinkedIn doesn’t always get it right, nor is this list comprehensive. Be proactive by using the job section in LinkedIn to search for the job you are looking for. Simply type in the job title and start to review the positions. 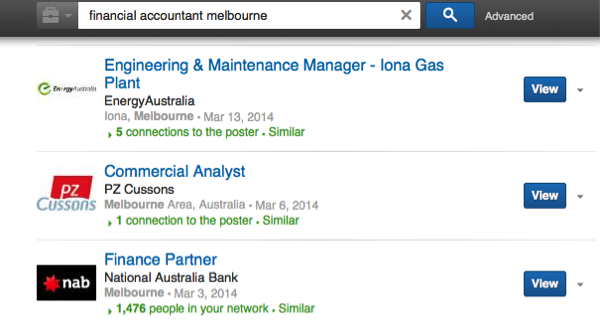 In the example below we were looking for financial accounting roles in Melbourne. When you have identified specific companies you are interested in working for, follow them on LinkedIn. You can follow up to 1,000 companies. By following a company you will get updates on key developments they post. You can use this information to connect with people in the company, or when meeting them for an interview. Often companies post jobs on their page, thus giving you access to new jobs. Click the filter icon to the left of the Search box at the top of any LinkedIn page and select Companies from the dropdown. Type a company name in the Search field. Click the Follow button to the right of the company name in the search results list. If you’d like to learn more about the company before following, click the company name to see more details. You can click the Follow button in the upper right of that page to follow.